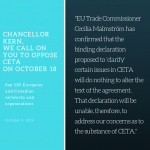 Our concerns regarding CETA’s ratification, letter to Minister Flanagan. You are here: Home / Attac Campaigns / Our concerns regarding CETA’s ratification, letter to Minister Flanagan. 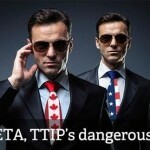 We, at Attac Ireland, are gravely concerned that CETA, the planned trade and investment agreement between Europe and Canada, could be put in place without national parliaments being consulted about it. Current indications are that this may occur either because the agreement is deemed not to be a “mixed agreement”[see 1, below], or because the Foreign Affairs Council of the European Union may take a decision on the provisional application of CETA before approval by the EU Parliament or by national parliaments. 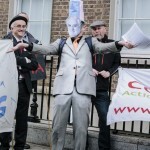 There has been little public discussion of CETA and of its implications for Ireland, and it is therefore utterly undemocratic to contemplate its provisional application. – – An Investment State Dispute Settlement mechanism, now re-baptized ICS, which would enable multinational corporations to sue any government for implementing measures which could affect their present or expected profits and would therefore restrain the capacity of the state to legislate for the benefit of citizens or the environment. – – A Regulatory Cooperation Forum, which would over-ride the powers of the state to regulate in the best interests of citizens. – – The obligatory opening to private corporations of markets and services which could otherwise have remained in the public domain, such as health, education, water, etc…, as exposed in Liberty Hall on 9 November 2015 by various speakers, including world renowned Canadian author and activist Maude Barlow, a former senior UN advisor on water and an expert on CETA. – – The absence of binding measures on social and environmental sustainability. We are particularly concerned at the fact that CETA’S chapter on domestic regulation seems “designed to kill efforts to regulate the resource industry” and is in complete opposition to all commitments made by either Europe or Canada to take action on climate change. 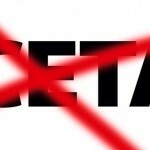 1) To have CETA recognized as a mixed agreement. It is our intention to publish this letter to you on our website. Following receipt of your written answer, we are at your disposal, should you wish to meet us.